Exceptional anti-fatigue comfort. Standing is believing! Waterproof and washable. Easy to clean with soap and water! 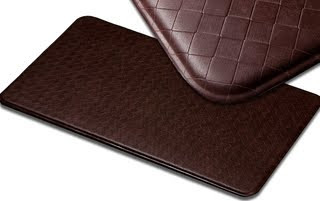 To relieve your aching back and feet Imprint Comfort Mats has offered one of our lucky readers the chance to win one. What room would you put your Imprint Comfort Mat in? In the kitchen, in front of the kitchen sink, give my feet some comfort while washing dishes. Definitely the kitchen - those hard woods are killer (and getting colder these days! I would put the Imprint Comfort Mat in my kitchen - it would be great when I'm washing dishes! I would put this in my kitchen in front of the sink. I would put the mat in my kitchen. That is where I stand for long periods of time! I would put it in my kitchen where I stand a lot! In front of the stove, no question about it!